Admittedly, we have a lot of fun experiences, maybe more than the average family. 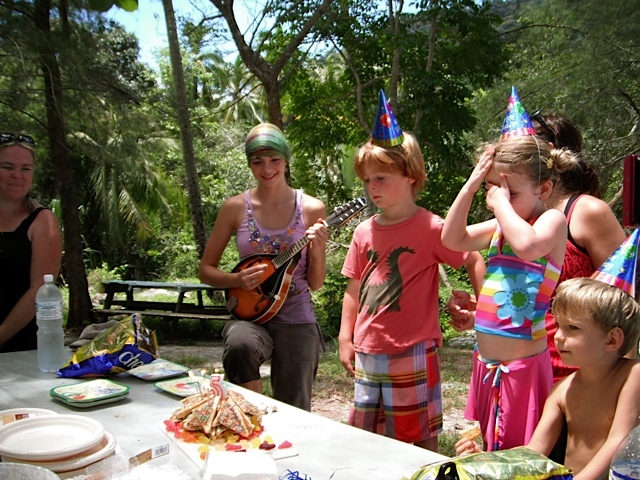 Our most fun experiences are shared with others. Meeting other travelers or locals transforms a time that would have been simply memorable to extraordinary. The energy level of our meet up in Penang was immense. We traveled to Penang to meet up with 7 other families that inspire, motivate and give us the ‘ants in the pants’ need to explore more. After returning to Bali, we went into a vacation slump. The Penang meet up was fun-loving, relaxed and jovial. Each family dreams of a lifestyle that defies convention and we work to make those dreams our reality. Being around that energy was awesome! This day was an extraordinary day! 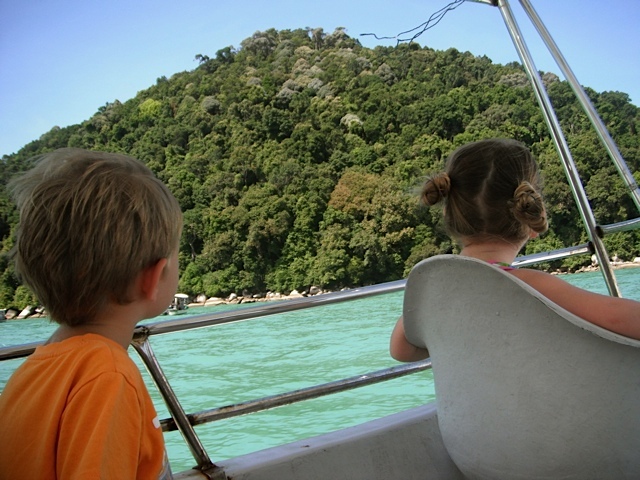 We took a boat out to Monkey Beach to celebrate a 5 yr old’s birthday on a beautiful beach. 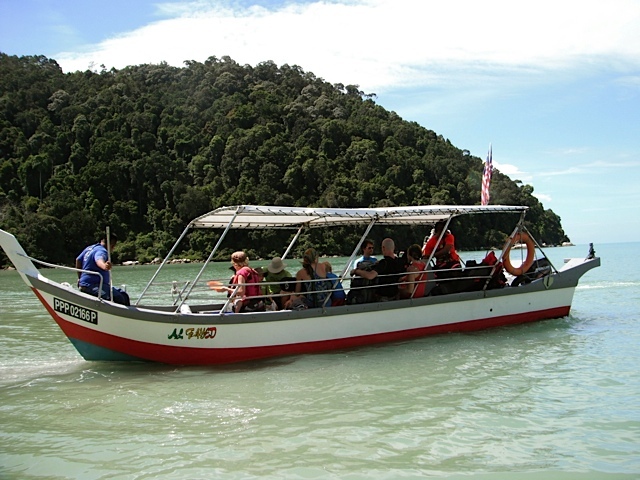 We had 30 people in our group which required 3 boats to transport us to a meromictic lake, explore a turtle sanctuary and then on to Monkey Beach inside Penang National Park. Our first stop was the meromictic lake, where the layers of fresh and sea water do not mix. A natural phenomenon that we must see, we thought. 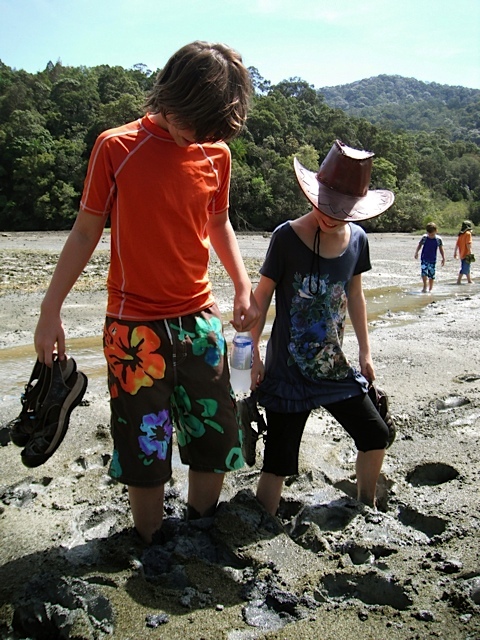 Once we got there, all we saw was a stinky mud pit, which we naturally stomped all over. Making fart noises with feet never gets old. Meromictic lake sludge sounds like this: Pfft, thlurp, pppptttttt. This lake is a seasonal meromictic lake and we came during the wrong season. On to the turtle sanctuary we went to observe a few turtles. Frankly, we’ve seen lots of turtle sanctuaries that this one was un-noteworthy. 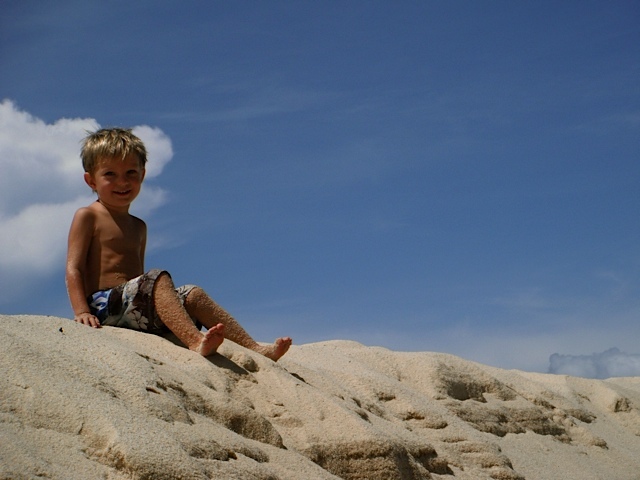 Never ones to spoil an experience, G and I used the beautiful sand hills to have fun and slide down, over and over and over again. Filling our suits with hot sand and our bellies full of laughter. Using gravity for create some fun. Back into the boat to enjoy the cooling ocean breezes and ponder just how awesome it is to not have a 9-5 job. I was feeling very grateful that the other people in my boat felt the same way and that we were spending this day together with all our children. Feeling grateful never gets old. Enjoying the water and searching for “broccoli trees”. 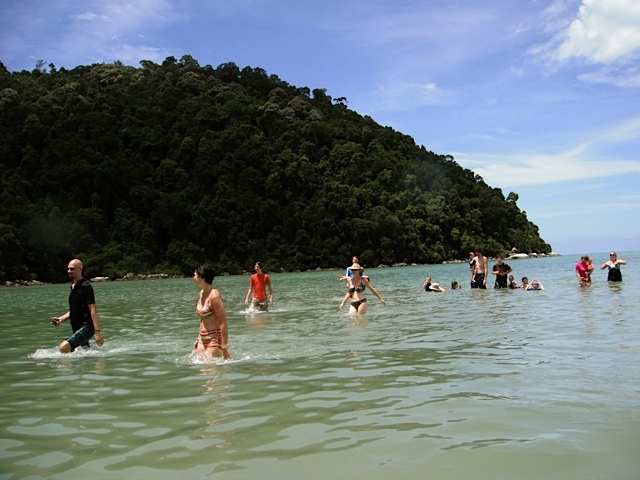 When we finally arrived on Monkey Beach, we were greeted with creamy sand and turquoise waters. Food was spread over the picnic tables, we ate and enjoyed conversations when the strangest cake I’ve ever seen was put on the table. 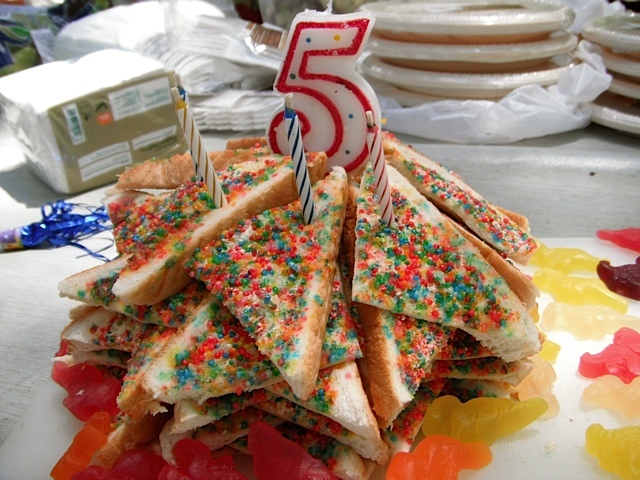 It’s called Fairy Bread and it’s a staple at all Australian birthday parties. Essentially it’s white bread with butter and loads of sprinkles. What’s not to love? Especially when there are loads of gummies around it! Celebrating never gets old, especially on a beach. We spent 4 hours on the beach, full of all sorts of activity. The older boys in the group caught a huge crab. 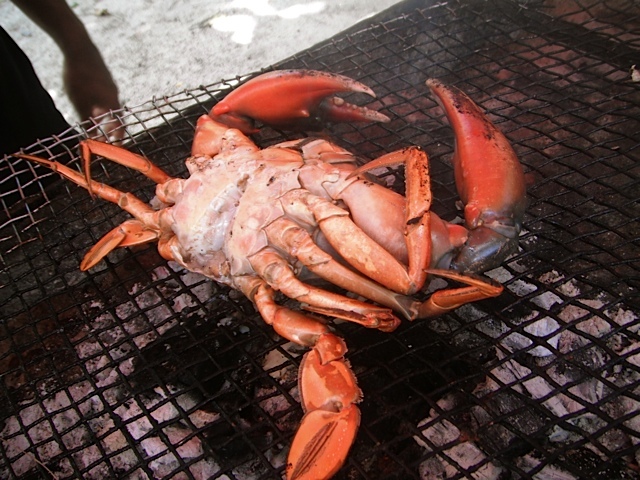 They wrapped it up in rope and, with the help of a local man, grilled it up on the spot, enjoying the freshest grilled crab ever! 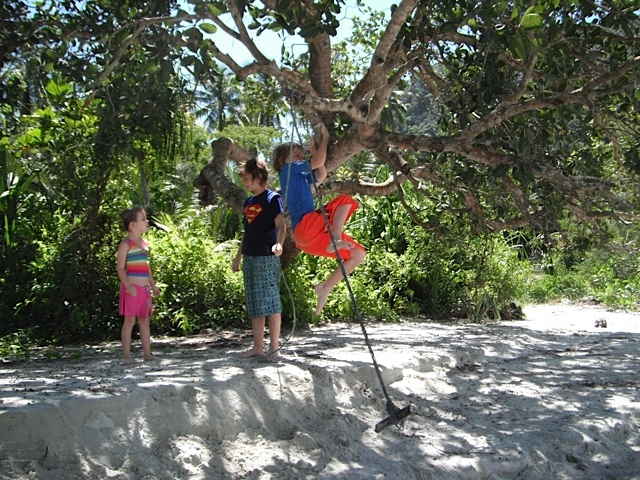 The younger boys made themselves a tarzan rope and tried to get the youngest ones to be the practice stunt-men. 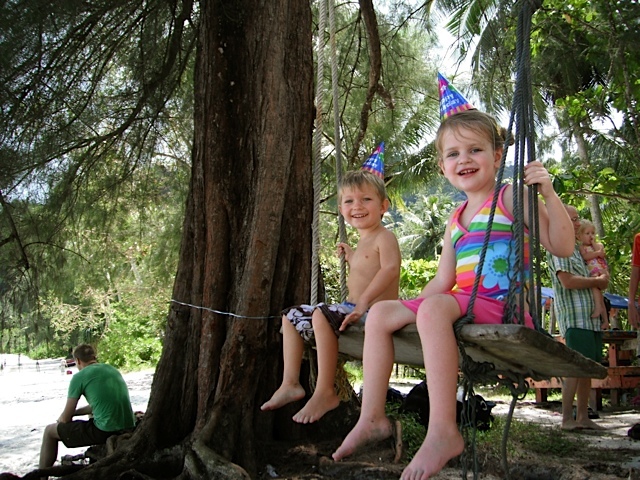 We swam in the too-warm ocean, until the monkeys decided to herd into our picnic space. That’s when we bolted out of the water to gang up on the monkeys and save our food. Going to save our food! We enjoyed the beautiful soundtrack of talented Hannah Miller. And most of all, we enjoyed getting to know each other offline. 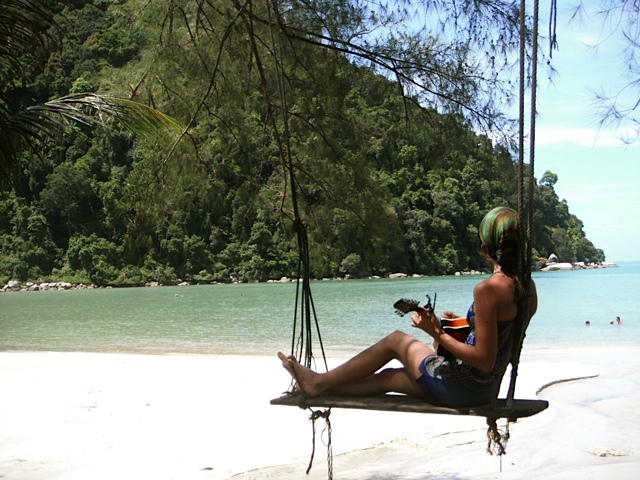 The trip to Monkey Beach reinforced my thoughts that I have some of the coolest people as friends, online and offline. They are awesome. And they have awesome kids. Watching teenagers and toddlers playing together was an affirmation that road-schooling and this lifestyle is a great choice.